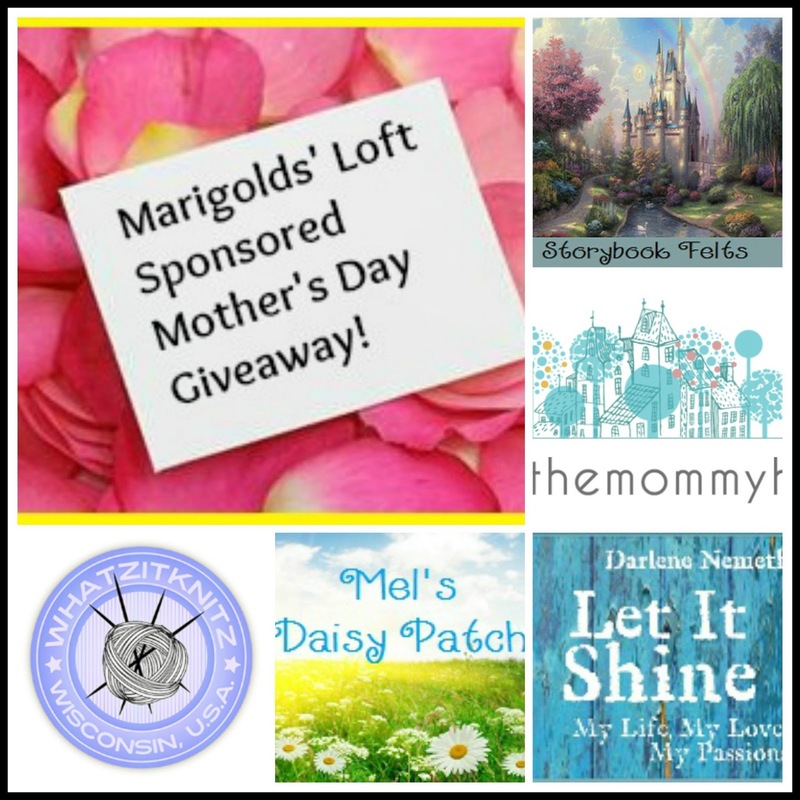 Marigolds' Loft: Make your Mother's Day Extra Special with this Sponsored Giveaway! Make your Mother's Day Extra Special with this Sponsored Giveaway! Welcome to my wonderful Sponsored Mother's Day Giveaway! I am Melissa Graham, Owner of Storybook Felts and Mel's Daisy Patch Crochet. I love to do all kinds of crafts. Crochet has been my passion for years. Then, I just recently discovered my love for making goodies from felt and am having a blast with it. I also love to share my love for crafts on my blogs. My favorite thing about blogging is all of the wonderful people you meet. My best friend and I met through our love of crochet and our blogs. Hi I am Mary Jo and I love to knit - which is lucky because I live in Wisconsin where you need warm wooly knits 8 months of the year. Of course after a while you have more hats and mittens than you need so I knit toys too. A couple of years ago a charity I knit for asked me to share my toys patterns which has turned into a family project now. My daughter and SIL help me edit and turn my patterns into pdf files. And my sister test knits my patterns. During the warmer months of the year you might find me in the garden dyeing yarn with the flowers I grow. I am Darlene and I live in southern Ontario with my wonderful family. Our home is my sanctuary - my center and I am so very grateful to have it. I work full-time as a Human Resource Manager. I love my job and look forward to going into work each day. I am more than just a HR Manager. I am an artist who loves to create and appreciates the skills and efforts of other artists. The need to create is in my blood, passed down from my mother and then to my daughters and granddaughters. I'm Shannon and I'm a blogger, designer, wife and stay-at-home mom to 2 daughters, who is happily living a handmade life near the ocean on Vancouver Island, BC, Canada. It brings me so much happiness to see others create something they treasure made from the little ideas that wake me up at night to sketch out. I adore finding new and different ways to construct garment and accessory patterns for the modern knitter and sewer. And lastly, I, Natalie, will be offering the winner 2 of my patterns that I have for sale as well as a $5.00 Cash Prize. What are you waiting for - hurry grab your chances to win! One Winner gets all of the above!! The giveaway will close on the 13th May 2013. This is an international Giveaway and to qualify for the cash prize you have to have a Paypal account. All patterns are offered to you as downloadable PDFs and will be sent to you by the sponsors themselves. Do make sure you include your email addy in the Rafflecopter below so that we have a way of contacting you. Good Luck one and All! Would you like to be included to sponsor such a fab event? My Sponsored Father's Day Giveaway Sign-up has just opened up. With as little as $5 you and your blog will be included :) Places are limited. Thanks for the giveaway - a nice Mother's Day treat! Great give away! Thanks for hosting! Craftsy FREE Course Sign up - Today Only! Some Great Exposure for Father's Day! 1 Giveaway, 2 Books, 3 Projects - Oh My!